Tepid private-sector hiring, high unemployment, contracting retail sales and weakening housing activity tempered enthusiasm surrounding the pace and sustainability of the recovery. Continued industrial output, however, will have a far-reaching impact on economic growth by spurring job creation not only in the manufacturing sector, but also in transportation, distribution and sales. This ripple effect will help sustain the economy, offsetting the lackluster performance of other economic drivers and resulting in relatively flat, albeit choppy, economic growth through the remainder of the year. Industrial production, which measures manufacturing, mining and utilities output, rose 1.2 percent in May, the strongest increase in nearly a year and the 10th gain in the last 11 months. The manufacturing sector continued its recent improvement, bouncing back 7.9 percent from one year ago and fueling job gains in the manufacturing sector. Manufacturing expanded in each of the first five months of the year, accounting for one-fourth of all private-sector job growth. Further additions are likely, with the average manufacturing workweek recently eclipsing 40 hours. In periods following past recessions, manufacturing employment growth expanded at an annualized rate of nearly 2 percent when the average manufacturing workweek was in the 40- to 41-hour range. With nearly two-thirds of the government stimulus already spent or earmarked and consumers stymied by the challenges of high unemployment and the weak housing market, business spending will be crucial to the sustainability of the recovery. Nonfinancial companies have accumulated more than $1.8 trillion in cash and liquid assets, a 26 percent spike from one year ago and the largest annual increase on record. With interest rates stuck near zero, firms will slowly put accumulated cash to work, assuming European debt concerns do not stall global credit markets. To capitalize on the prospects of growing demand, business equipment manufacturers increased production by 1.9 percent in May, the third consecutive month of strong gains. Output of business equipment has risen 11.7 percent from one year ago. Increased industrial and manufacturing production will yield direct benefits among warehouse and distribution facilities as goods coming off the assembly line are warehoused and transported to end users. 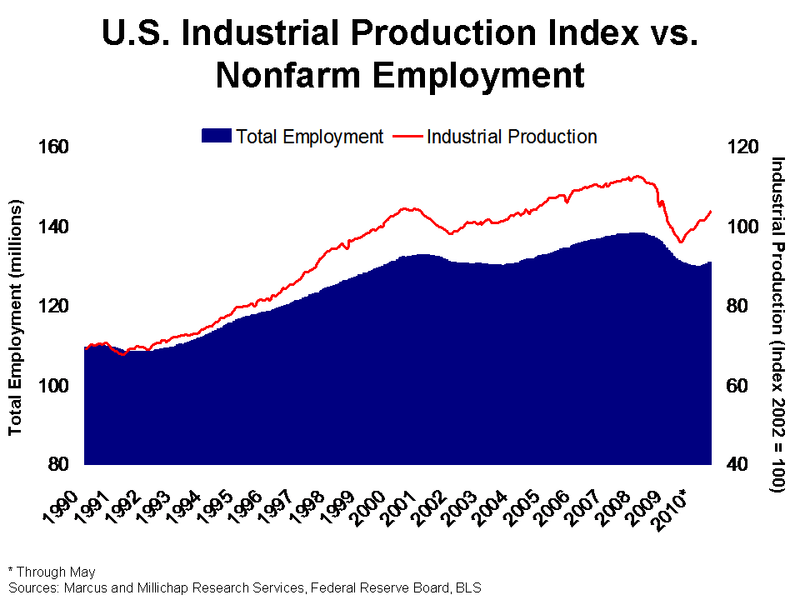 National industrial vacancy will rise 40 basis points to 13 percent this year, however, as an oversupply from a wave of speculative construction a few years ago is absorbed slowly. In addition, many tenants maintain a glut of under-utilized space that must be filled ahead of committing to additional product. While business investment and capital expenditures will gain momentum, private employers remain concerned about the possibility of a double-dip recession and have thus far delayed adding new permanent employees. Less than 10 percent of the jobs created in 2010 have been in office-using sectors, and even as positions are generated, employers will fill empty cubicles well ahead of requiring additional space. Office vacancy will increase 100 basis points to 18 percent this year on negative net absorption of nearly 25 million square feet. This entry was written by marcusmillichap, posted on June 30, 2010 at 12:12 am, filed under Research and tagged Industrial Production. Bookmark the permalink. Follow any comments here with the RSS feed for this post. Trackbacks are closed, but you can post a comment.